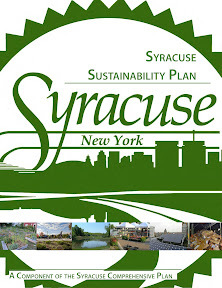 The City of Syracuse's Draft Sustainability Plan is now available online. Click here to download the Draft Sustainability Plan. The Bureau of Planning and Sustainability is in the process of developing Syracuse’s Sustainability Plan which will be a component of the City’s Comprehensive Plan. This plan will look into the needs and the current resources of the city and create goals and initiatives to meet these needs without jeopardizing the city’s future. These goals and initiatives will not only take into consideration the city’s environment and natural resources but also focus on the city’s economical and community/societal development. The sustainability plan will serve as a guide for the city as well as the community to improve the city’s quality of life now and for generations to come. The plan is being created because the city and those in the community who have a vested interest in creating a sustainable Syracuse realize we have to address issues concerning sustainability now. The plan will ensure that future citizens of Syracuse will have a more environmentally aware and economically aware place to call home. The City’s Bureau of Planning and Sustainability (The Bureau) will head up the development of the Sustainability plan. The Bureau will also partner with other city agencies such as the Department of Public Works, the Department of Engineering, and the Transportation Department, to create the Interdepartmental Team on Sustainability, to get their feedback on goals and initiatives that should be added to the sustainability plan. The Bureau will also create a Sustainability Community Advisory Committee, made up of community leaders throughout the city that will provide guidance on the goals and input on strategies to develop the plan. Furthermore, the Bureau will look to the Interdepartmental Team on Sustainability and the Sustainability Community Advisory Committee once the plan is complete to assist in the implementation of the initiatives to reach our goals. The Sustainability Plan will be broken up into five components: Waste & Recycling, Energy Conservation & Green Building, Food Systems, Green Education & Training, and the Natural Environment. Other topics such as Land Use, Transportation, and Economic Development will not be covered in this plan but rather as separate components of the Comprehensive Plan. The Comprehensive Plan and all of the components will embrace the pillars of sustainability. In instances where there are overlaps on topics, the plans will reference where additional details can be found within the Comprehensive Plan. The sections will list clear and measurable goals created by the Bureau, the Interdepartmental Team on Sustainability and the Sustainability Community Advisory Committee. We will also be looking to the community for feedback and input on creating goals and strategic initiatives to reach these goals. We look forward to working with the community on making the Sustainability Plan a guide to Syracuse’s future.